Nava Atlas is the author and illustrator of many books on vegan and vegetarian cooking, most recently Wild About Greens and Vegan Holiday Kitchen. 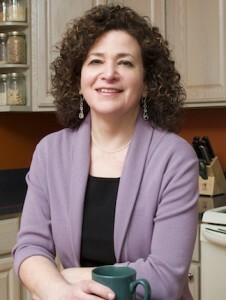 Her backlist includes Vegan Express, Vegan Soups and Hearty Stews for All Seasons, The Vegetarian Family Cookbook, and The Vegetarian 5-Ingredient Gourmet. Her first book, Vegetariana, published in 1984, is considered a classic in its field. 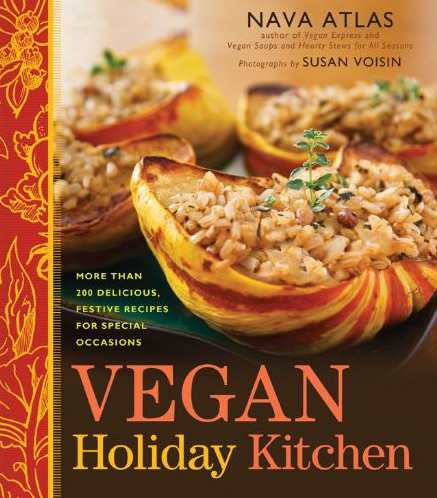 Nava’s book Vegan Holiday Kitchen came out in the fall of 2011 and it instantly became my go-to cookbook for the holidays. Polenta, Sausage and Mushroom Stuffing and Pumpkin Cheesecake with a Hint of Chocolate have both become mainstays on my Thanksgiving table, and I’m excited to make them again tomorrow. Since Nava is my my holiday recipe guru, I asked if she’d like to chat about holiday cooking, being vegan and her upcoming projects. 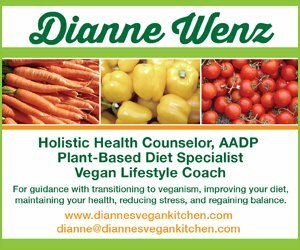 Chic Vegan – I know you were vegetarian for a long time before you went vegan. What inspired you make the switch? How long have you been eating meatless? Nava Atlas – I was a child who hated looking at meat, and a rebellious teenager. The concept of vegetarianism was barely a blip on the radar in the time and place I grew up. I knew nothing about being a vegetarian other than that I wanted nothing to do with meat. I finally declared myself at 17. It was easy to remain a vegetarian when I met my husband, right out of college, who wanted to eat the way I did and reacted with amazement at everything I concocted. We raised our two kids vegetarian. Then the age of the Internet came along, and I started to find out all sorts of things about dairy. Long story short, our son Evan was the first to declare himself a vegan, at age 10. I’d been thinking about it, but I made the leap soon after he did. That was over 11 years ago. 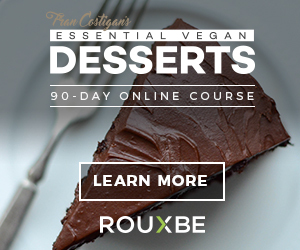 CV – I love your cookbook Vegan Holiday Kitchen! I do a lot of my holiday cooking from it. What inspired you to write it? NA – In 1990, an earlier version of this book was published, titled Vegetarian Celebrations. A holidays rolled around, especially Thanksgiving and Passover, I’d always be asked for ideas on what to serve to the lone vegetarian guest at the meal. Fast forward 20 years, and now it’s the vegan at the table whose needs must be addressed. As you know, the entire plant-based cuisine come into its own. Now, we have our own glorious way of celebrating, with delicious and sophisticated food — we vegans aren’t just sitting quietly and expecting Aunt Lulabelle to set aside some green beans and other side dishes (hold the butter) for us to pick on. I wanted Vegan Holiday Kitchen to celebrate fresh, seasonal holiday fare that does no harm to living beings. CV – What have you been cooking up this holiday season? 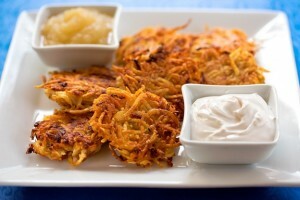 NA – I just did a test-drive of baked latkes. Duh! I can’t believe I haven’t been doing that all along! Latkes are usually fried in oil, per tradition, and though I’m not a no-oil person, the plethora of oil used and the way the frying process made the entire house (and my hair) smell of latkes for days on end has never endeared itself to me. I couldn’t believe how much easier and cleaner it is to bake them. And they taste just as good, if not better. CV – Do you have any favorite holiday dishes? 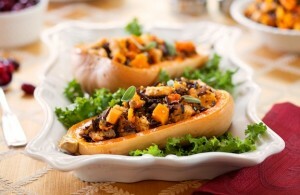 NA – For Thanksgiving, I do love a nice grain-filled stuffed squash dish, though I sometimes make other things. Recently, I did a post on some of my favorite Thanksgiving recipes. Some of the holiday fare I turn to year after year are things that are already “tradition” in my family, but that in no way resemble what I grew up with. In other cases, nostalgia has driven me to create vegan versions of dishes I grew up with like matzo ball soup for Passover. CV – What would you cook for a holiday dinner party of die-hard meat-eaters? NA – I might choose something comforting and familiar like Lentil and Mushroom Shepherd’s Pie. But honestly, I’ve been entertaining eaters of all persuasions for so many years, and no one has ever left the table unhappy or dissatisfied. So much of the experience is not just the food (which I strive to make as tasty as possible, especially for the purposes of persuasion) but the spirit in which it’s serves — joyfully and unapologetically! CV – Your cookbooks The Vegetarian 5-Ingredient Gourmet and Vegan Express were among the first I owned as a vegan. At the time there weren’t very many vegan cookbooks on the market, but now it seems that a new one comes out every day. What do you think of the vegan cookbook explosion? Is the market too saturated or have we reached a cookbook renaissance? NA – That’s a great question! Seriously, when my first book, Vegetariana, was published (in 1984! Yikes! I was 5 years old when it was published …) there weren’t even that many vegetarian books on the market. 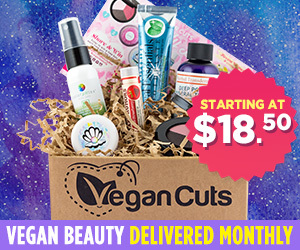 Now, as you suggest, the market seems flooded with vegan titles. Looking at it in a more positive light, think of all the baking books out there, or all the Italian cookbooks. No one seems to think the market is saturated with those, and they just keep coming out. So, as plant-based cuisine expands and more people embrace it, there may be limitless room for specialized titles within this niche. CV – I know that you’ve been working on another book. Can you tell us a little about it and when we can expect it? My next book is Plant Power, coming out in the early fall of 2014 via HarperOne. 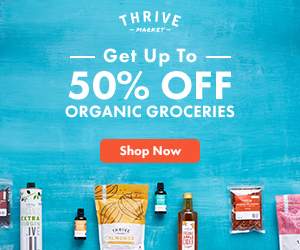 It’s mainly about getting dinner on the table and how to easily create complete meals, but in addition, there is a whole section on how to transition to a more plant-based kitchen, with tips on shopping, pantry, meal-planning etc. My art site was just redesigned and we’re still tweaking the typography but hopefully things will be in top shape by the time this interview runs. 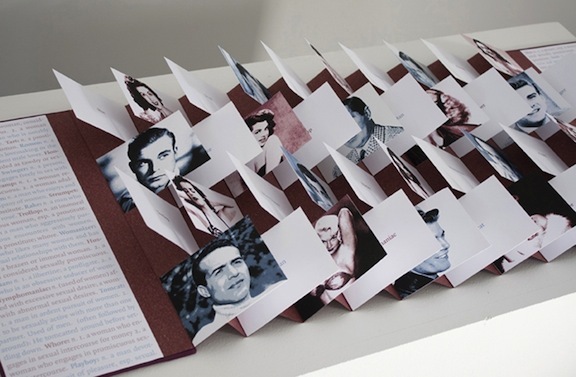 Most of the places in which my work is exhibited are colleges, universities, or alternative art centers. You won’t find my work over any sofas; beyond what might at first seem humorous, it’s designed to provoke. One of my best known pieces, for example, is Sluts & Studs, and is about the bias inherent in language. Is there anything else we can look forward to from you in the future? I’m doing a lot more exhibiting, and I hope to do more limited edition artist’s books in the near future. My personal work often deals with issues of gender and social justice, but I’m also embarking on a series that overlaps with my concern for animals and the earth. The series is titled “Meat Science” and will strive to get viewers to look at, and think about, difficult issues with my characteristic use of irony. Other than this, I’m still working on growing VegKitchen.com, and I may have a few cookbooks in me yet, despite my occasional protests to the contrary!